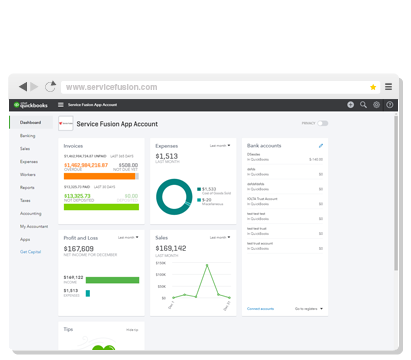 Managing your customer accounts is a breeze with Service Fusion. Easily access customer's contact information, set their personal communication preferences, billing terms, store private and public notes, track referral sources and a lot more. 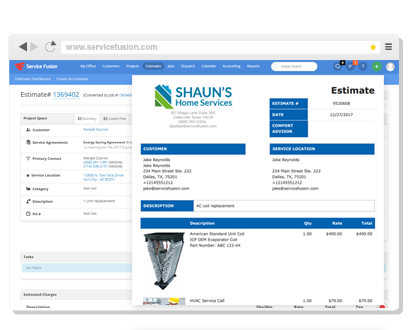 Create estimates and jobs in seconds with pre-populated product and service line items. 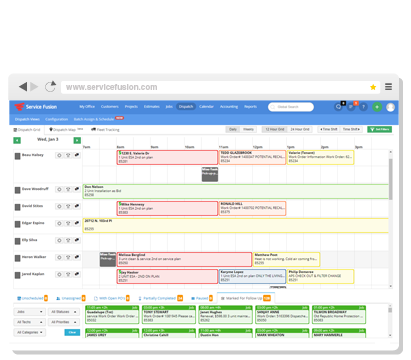 Add documents and pictures, rate opportunities with stars and schedule on-site visits by dragging your cursor over a time slot on the calendar. Our drag & drop dispatch grid allows you to easily assign work to your mobile workforce. Dispatch job information to your field workers' mobile phones with just a few clicks either via text messages or via our mobile web app. 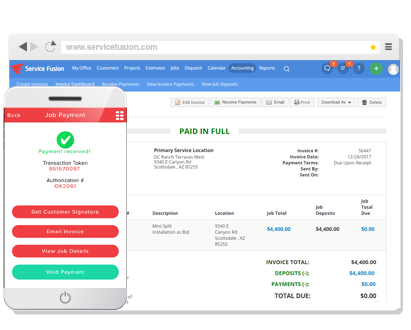 Being able to measure accurately the numbers of jobs completed, billed, invoiced, paid in full. The productivity levels of each team member makes it much easier to manage and strategically grow the business. 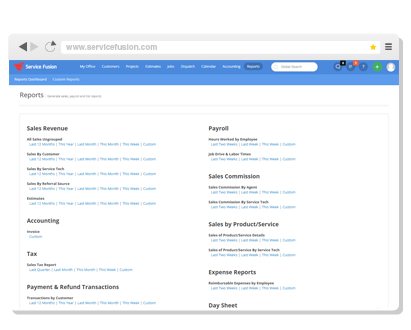 With our integrated invoicing and payment processing system you can convert jobs to invoices with a single click and receive payments against those invoices directly within the system. No need to use a third-party application. Keep your accounting system up to date without having to press a single extra button. User-friendly. Syncs with QuickBooks with no problem. Runs smooth daily. 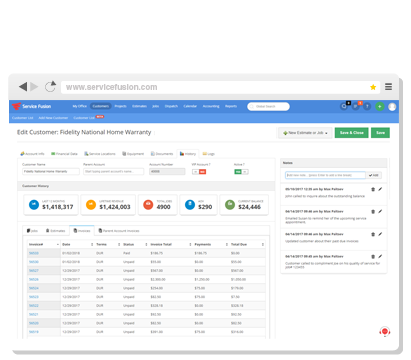 This program has made it very easy for us to keep track of service calls, invoicing, and customer information. Manage your stock inventory using our built-in inventory system. 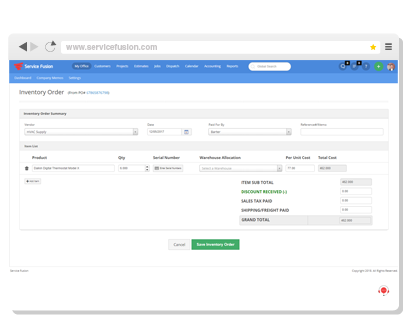 Create multi-item purchase orders, assign them to multiple warehouses and optionally enter serial numbers for those items that need to be tracked. Our system monitors daily office activity, staff work hours and your mobile workforce, clocking in out. 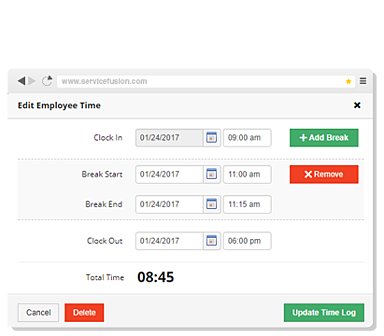 populated time-based payroll reports with regular overtime pay. 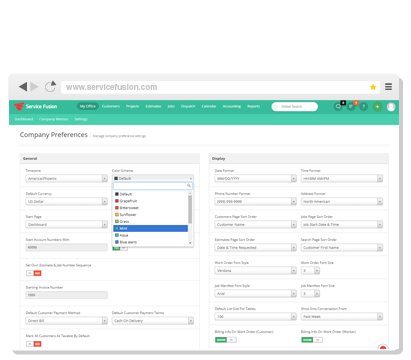 Select from anumber of pre-built sales revenue, sales commission, product & service sales & referral source reports. Our system has an array of preferences that allow you to customize the way certain information appears on screen, in email, voice and text communications. It also allows you to set user-specific permissions for each of the system's many modules. 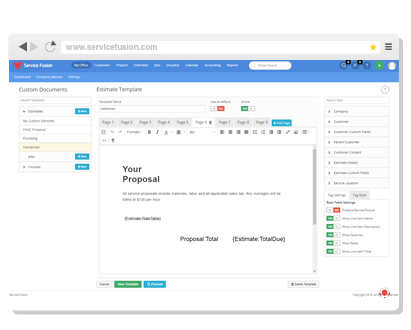 Create completely customiized single or multi-page proposals and personalize estimate, work order and invoice forms. 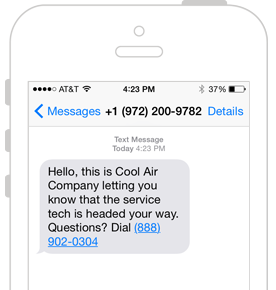 Improve customer satisfaction and increase loyalty with automated notifications and reminders.